This is a Howto about installing MariaDB Galera Cluster on Debian 8 Jessie. Installing MariaDB Galera Cluster is in fact quite easy and actually kind of boring in the end. This Howto is written for (and tested on) on Debian 8.3 (Jessie). In our setup we assume 3 nodes (cluster01, cluster02, cluster03) with one interface each. We assume following IP addresses: 10.0.99.31, 10.0.99.32, and 10.0.99.33. As Galera does not ship with the distribution repositories, go for the repo configurator and follow the instructions to include the repository fitting your system. Keep in mind to Choose „10.1“ in Step 3 (Choose a Version). So we have to do some configuration next. 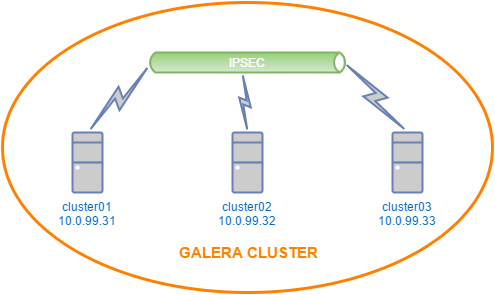 There is a MariaDB configuration part and one part to configure Galera (starting with wsrep_). As we do the most basic and simple installation in this Howto, it is sufficient you just change the IP’s (Remember: 10.0.99.31, 10.0.99.32, 10.0.99.33) with your IP’s. In our example, we have set hostnames on each node (cluster01, cluster02, cluster03) so we do not need the IP addresses of the hosts. We could also change the cluster name by changing the value of wserp_cluster_name to fit our style. This setting also works as a shared secret to control the access to the cluster. With wsrep_cluster_address you see the hostnames of our setup. wsrep_cluster_address could also be gcomm://10.0.99.31,10.0.99.32,10.0.99.33. Multiple IP’s or hostnames have to be comma seperated. The wsrep_sst_method tells what method to use to synchronise the nodes. While there are also mysqldump and xtrabackup available, I prefer rsync because it is easy to configure (i.e. it does not need any credentials set on the nodes). If you are considering using the xtrabackup method, don’t forget to install xtrabackup. Debian/Ubuntu uses a special user (‚debian-sys-maint’@’localhost‘) in their init script and the credentials for that user are stored in /etc/mysql/debian.cnf. This user is used to make some checks starting MySQL. Checks I don’t think belong into a service script anyway. Because of the unique password for the user on each system, mysqld will throw some errors while starting and stopping. So we’ve got to fix it, by copying /etc/mysql/debian.cnf from the first node (cluster01) to all other nodes. So the data and configuration files have the same data. The configuration file (galera.cnf) is already distributed to all nodes, so we next start the first mysqld on cluster01. This node initializes/starts the cluster (creates a GTID). Let’s pause here and do a quick check. As we are running a cluster it is not important if we execute the following on cluster01 or cluster02. The node with the highest seqno is your new first host. Excellent tutorial. Saved me days of Googling. The only thing I would add is the need for an extra line at the end of galera.cnf with wsrep-node-address= IP address of the local server. I found that without this, restarting the whole cluster failed because the database was marked as corrupt and wouldn’t start.